Rating: 10A 250VAC Contact: 1A1B Action force: 0.7kg Material of Rind: Plastic Cable type / length: 0.5mm2,3C / 1m Total Size: 100*60*33mm Quantity: 1 pcs Package Included: 1 x Foot Switch. Preowned, tested, in good working condition. Has scratches and wear. See pictures. Good working condition. What you see in the picture is exactly what you will receive! LOW STARTING PRICE! AND NO RESERVE ! 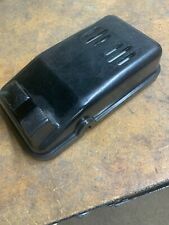 Vintage singer sewing machine foot pedal cast iron. Condition is Used. Shipped with USPS Priority Mail. 13 inches total length. Fully Tested and in Great Working Condition. Designed to operate on 220 V. Real colors may be slightly different from what you can observe due to amateur illumination procedures when taking the pictures. Excellent condition. Everything you need to know should be observable in the detailed pictures. It's a three pin plug model YC-50 ET. It's a three pin plug model YC-50. This unit has been tested to assure correct operation. Photos show the exact item you will receive. Everything included is shown. Used pedal in good working order. Untested item. Being SOLD AS IS. Singer Model # 347 Sewing Machine Pedal. The Foot Pedal Is Marked on the back Marked on the front: SINGER. Singer #102808, 2A. 3 Pin Plug. Top of plug: #2. Many I do not know anything about except for what I was told or what is marked. Many I do not know anything about. 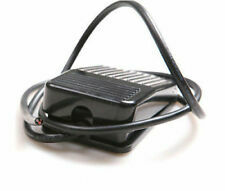 A Great Foot Pedal To Add To Your Sewing Machine! Many I do not know anything about except for what I was told or what is marked. This item was previously owned. Model 250 001. Many I do not know anything about. 77, IA-115V AC-DC, Tested Works. 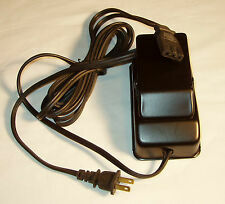 It's a three pin plug model YC-50 E.
DeJUR 4 Pin Foot Pedal Switch Controller Metal Made in the USA Sewing? Guitar??? preowned condition - pedal has good spring to it and looks to be working perfectly. 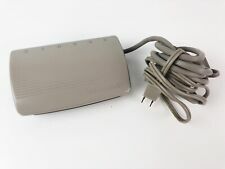 You are purchasing Singer Sewing Machine Power Cord Foot Touch Sew 600E fits other model. Part number 704 705. Pulled from working model. If you want to get your sweet 221, or other Singer back to the original Bakelite parts and running safely, this setup will be perfect. Used in Good Condition; AS IS. Used sold AS IS are in good condition see pictures. This pedal is in good used working condition. There is typical wear and tear apparent on this item. Scuffing and scratches are generally present throughout. Will not affect functionality of unit. You will receive everything shown in photos unless otherwise noted. Used in Fair condition sold AS IS see pictures. Model: 701 KNEE 702 FOOT. USA Retro Sew. Type: Sewing Pedal. Color: Blue Teal. Marked Solid State. Part # 604280-001. All in great used condition. Appears to be brown bakelite with the original cord. Not sure as to which machines or years this fits but those of you looking will know. Portion of cord covered in blue electrical tape. You will receive everything shown in photos (excluding display pieces) unless otherwise noted.